The Barber family has been farming and making cheese at Maryland Farm in Ditcheat, Somerset England since 1833. Today the Barber farms comprise 2500 acres of prime Somerset dairy land and are home to some 2,000 dairy cows. They continue to use traditional 'cheddaring' techniques, combined with a unique collection of traditional starter cultures, to create a truly authentic West Country Farmhouse cheddar. The secret behind Barber's 1833's unique character lies in the use of a collection of traditional starter cultures for which the family are the sole guardians. These cultures are the friendly bacteria added to the milk to start the cheese-making process and are the most important ingredient in determining the flavor and quality of the finished cheese. 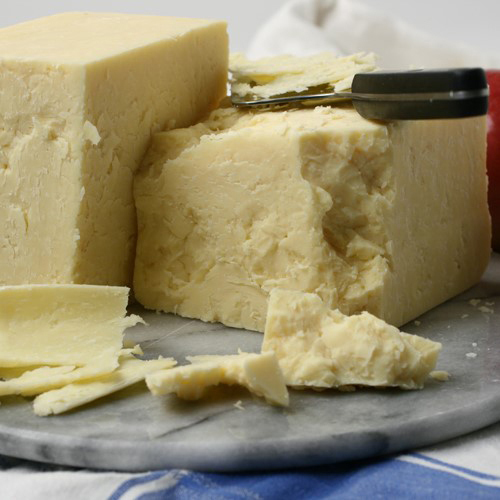 Barber's cultures are derived from bacteria naturally occurring in the milk of the region and have been isolated for their ability to produce great flavors and traditional cheddar character. Barber's are determined to preserve this collection of natural mixed starter cultures and to this end, have created a unique laboratory, dedicated to their preservation at Maryland Farm. It is these cultures that give 1833 its unique complexity of flavor, and they are determined to protect them - and the heritage of West Country Cheddar - for generations to come. Barber's 1833 Vintage Reserve Cheddar is the culmination of all their achievements. A deliciously creamy cheese with both savory and naturally sweet notes. Only the very best leaves the farm with the 1833 stamp.